This project morphed from something very small into something very transformative from it's inception to completion. What began as an idea to add solar hot water to the roof, ended up as a deep energy retrofit and full gut renovation of the upstairs. It was going to be necessary to disrupt the ceiling anyhow, so why not renovate the entire space while we were at it? The walls and sloped ceilings of the former space were covered in dark wood paneling, and the floor in brown and beige asbestos tiles. All of this heaviness made the already low ceilinged rooms feel even more confining. The renovation took a 180 degree approach, with the goal of making the space as bright and open as possible. 1 - The space that was once an oversized bedroom became a spacious upstairs living room, while what was once an oversized closet became a cozy new master bedroom. This programming switch gained an entire new living space for the house. 2 - The stair was pushed to the opposite side of its former wall and spun 180 degrees. This move took the stair access out of a secluded back hallway and turned it into a primary feature, central to the house. Light from the upstairs now pours down into the dining room and there is a strong visual connection between the levels. And perhaps most importantly, now when you arrive at the top of the stairs, it is no longer necessary to duck to avoid hitting your head on the ceiling! 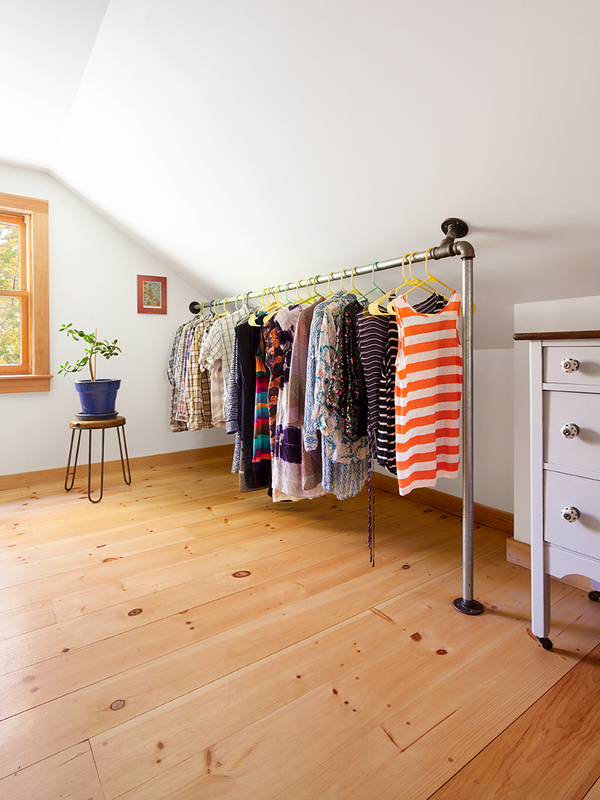 3 - The space was painted a bright white with light pine flooring and natural wood trim and built-ins. 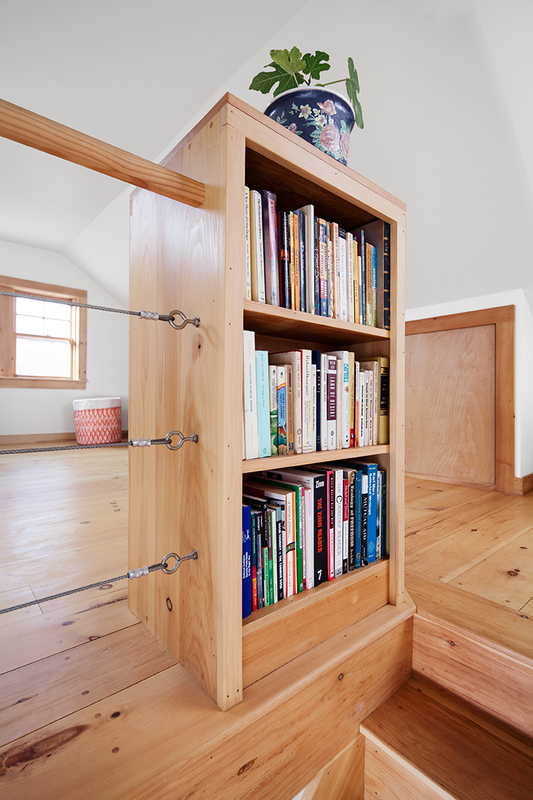 Sliding birch plywood panels allow easy access to eave storage and a double sided, built in bookcase also serves as a newel post and plant stand. 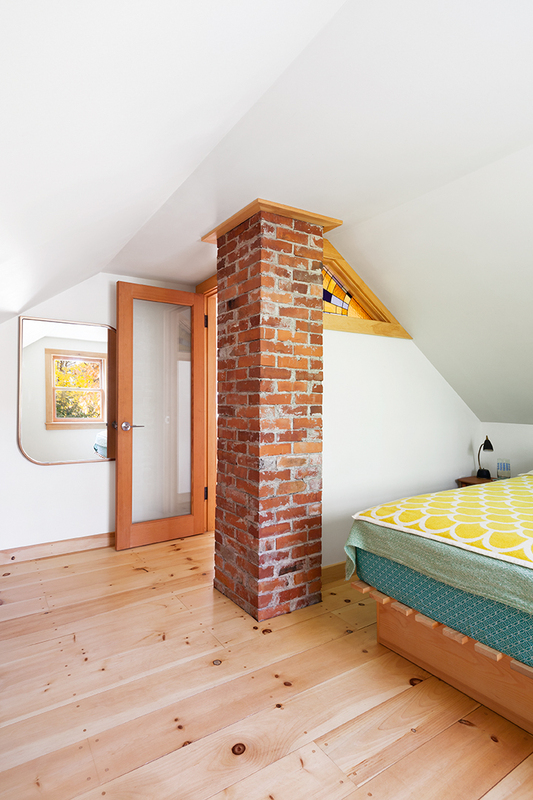 The brick chimney was also exposed during the renovation, adding extra color and character to the space. On the energy side, 3" of rigid foam were added to the ceiling and knee walls, and dense pack cellulose was blown in behind. The basement rim joists were insulated and air sealed and first floor framing cavities were insulated. This work, combined with solar hot water and a wood stove, now allows the 1200 SF house to run essentially oil free, while staying quiet, cozy and warm.